for less than a dollar after 4th of July. applies to all toys and wardrobe items. since we are teaching them that we do not hate anything. So this forsaken shirt needed a little makeover. scrap of fabric with no full versions of the flowers. but I am trying my best to use what I have first. Plus, I have no patience. collage of many different flowers and leaves. First I took the scrap and fused it to Heat n Bond. Then I cut random parts of the print out. I layered it on top of the tee until I somewhat liked the look. Ran an iron over all of the layers. Then I attacked it with my sewing machine. I used three different thread colors and combined zig zag and straight stitching. this would be the perfect project to try them out on. The more I stitched the more I liked how it looked. since absolutely no precision is required. Twenty minutes later, the cat is banished by simple, crazy cuteness. Love it!! That is so cute!! I agree with your husband I feel like they are too sneaky and mean. I do love that shirt, wow. I just cant belive how creative you are, I mean every post is like me saying I LOVE that so many times! julie you inspire me! this is so cute! i'm officially asking for a sewing machine for my birthday! Adorable. I am loving your blog! I like cats(smiles)but you turned it into an adorable shirt especially on your daughter. I would have never thought of that idea. Thanks for all your great ideas and keep them coming! That is so cute! I totally remember at MHSG Jason had a sticker or something that said "I love cats, dead ones." Sounds like that hasn't changed! PS .. I won't tell Miss Molly the cart comments .. she is a doll and is trained to sit at the door to go out just like the dog. :) No kitty litter here!! Well that just turned out precious! I love it! Your tutorial was totally Awesome! love it, I'm so doing that on some of my tees. what a great idea! I JUST got my first sewing machine and am in need of a good first project! SOOOOO Cute! However, you know me, CLUELESS and NEVER used Heat n Bond in my life (but totally want to now....what aisle at JoAnns? )so please fill me in if you can. Just iron on the heat n bond on the back of fabric?? Then cut the fabric? Then iron fabric on tee? See how much help I need?! Thanks Julie! You are so great! You, my blog friend - do you mind if I call you my blog friend? - are AMAZING! Love it. fabulous idea to cover up an ugly (or holiday) tshirt!! I am always on the search for plain tees, but now I know i should think outside the box. Beautiful! I need to learn to sew! Swirls of Creativity’s Purple Thursday ~ Every Thursday! This is gorgeous! 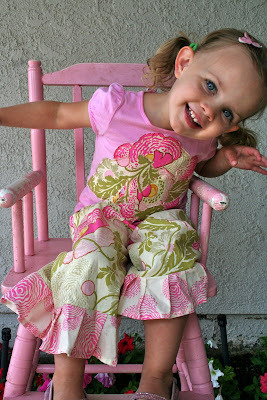 As if you can sew frilly trousers, too! oh my...Love it. Now I need to find a cheapy T for the project. I have admired your blog without a comment but today I cannot resist no more. You are so VERY VERY talented and I love your colorful pictures and what you can do with Target $5 holiday shirt. Yikes! I read your blog all the time and I LOVE IT but have never commented. You inspired me to learn to sew and I got my very first sewing machine!! This is a perfect idea for turning not so cute clearance tees into something adorable!! Thanks for all your cute ideas and inspiration! That is so so cute! I just love the things you come up with! So adorable and cute - love it! WOW, what an adorable little outfit you have now. And of course...precious little girl!!! Really cute! Thanks for the ideas! I might try it soon. I hope it's as cute as yours turned out. We'll see. i recently tried this, but found stitching on a t-shirt to be difficult. it was recommended to me to add wax paper as a backing as i sewed and that i could easily rip it off when finished. and i want to make those adorable pants! That is SO SUPER CUTE! Thanks for sharing! People like you are the reason that the internet is an exciting place to be.